Make a style statement with this upholstered chaise. The graphic print and tufted accents speak volumes about your exceptional taste in dicor. The highly resilient foam-cushioned seating and high back offer you luxurious comfort, while a hidden compartment offers you storage for your favourite novels, magazines and other lounging essentials. 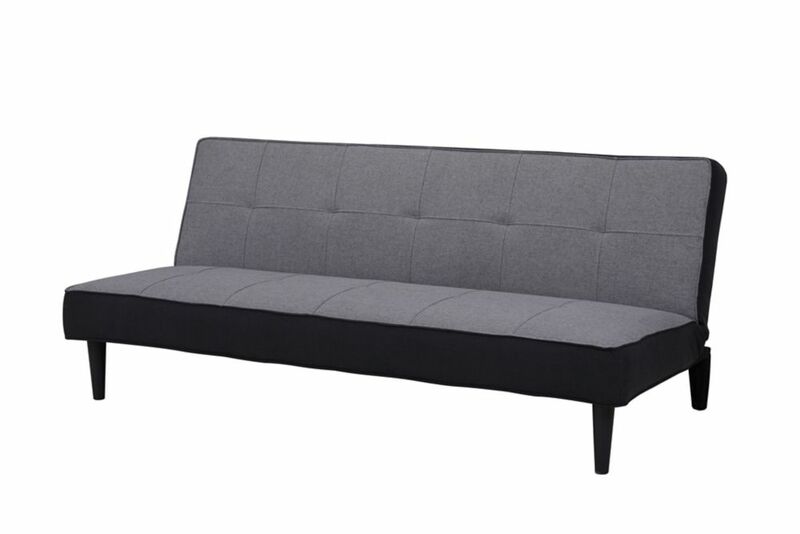 DHP's Emily Convertible Futon has a split-back to match the individual preferences of your guests. With its Click-Clack technology, the sofa easily adjusts from sitting, to lounging to sleeping positions. The faux-leather material is sleek and simply wipes clean. The cushions are full and stay firm even through excessive daily use, and the high density polyester and foam provide the utmost in lateral comfort. The versatility, modern appeal and value of the Emily Split Back Futon make it the must-have item for your home. This mission style dark oak wood rocker evokes old world charm. The generously padded seats and backs are upholstered in 100% leather which provides a comfortable and luxurious seating. The craftsmanship and look of this rocker will surely compliment any traditional dicor. A truly beautiful and functional accent addition for a variety of rooms in your home. 35-inch x 70-inch Wood Frame Sofa Bed with Futon Mattress in Grey Fabric is rated 4.8 out of 5 by 6. Rated 5 out of 5 by Qruistine21 from Daughter love it! I bought this for my daughter so whenever she have a sleep over, she have an extra bed to use for. All I need is to bring the box I. Her room and no assembly needed. She set it up herself( she is only 11) She got complimented by her friends how comfy it is. Also good style. Good deal for good price . Rated 5 out of 5 by Ger977 from Very good. Bought this sofa two months ago. All happy. Compact, easy to use. Rated 5 out of 5 by Chillary from Good Value This smaller sized futon fits well in my small space. Good value for what it is. Rated 5 out of 5 by Clee from Great price and size I bought this for my office because I wanted no arm rests on the sides. It's perfect for what I was looking for in size as well. It's comfortable enough, as I don't use it often and the price is very reasonable.